UFO SIGHTINGS DAILY: Evidence of giant aliens race found mingling with Native Americans, April 2016, Video, UFO Sighting News. Evidence of giant aliens race found mingling with Native Americans, April 2016, Video, UFO Sighting News. There are actually dozens of reports about contact or witnessing giant aliens (Friendship case, Rocca Pia) and even tiny 3cm tall aliens (Apollo 20 testimony by William Rutledge). There is also a powerful group on this planet that tries to prevent the discovery of such evidence by stealing it and making it disappear, so says records of almost all giant skeletons found around the world and in America. I was recently in Burnsville North Carolina speaking at a conference there. My host, Emily took to me to father's and uncle's store, Rings and Things and what they brought out from the back room was simply astonishing. 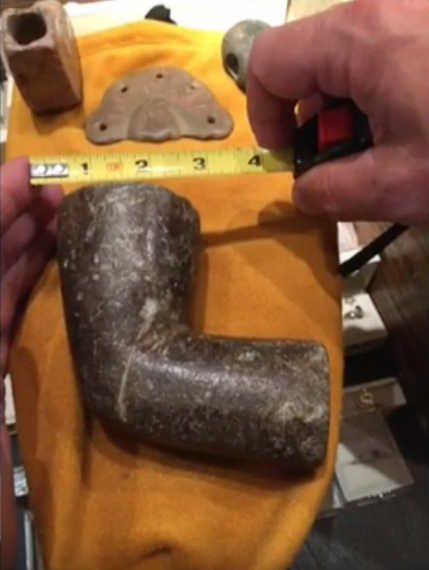 IN this video you will see a very large pipe. 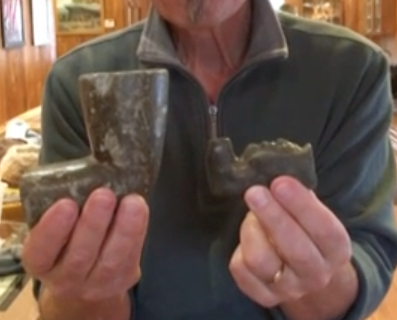 Is it ceremonial as some main-stream anthropologist will insist, or does this pipe point to the veracity of the Native American Oral tradition which tells us Giants once roamed the land. Come with me as we explore what may be a Nephilim Artifact, with a special appearance by Chied Joseph Riverwind and Dr. Lauralynn Riverwind.